Can you believe that I got nominated for another Sunshine blogger award? I can't believe it. Mostly because I thought my blog posts were too depressing and because I have had emails from blog visitors asking me to lighten things up a bit. But I am really happy to receive this award again. I have to say a big Thank You to Deanie Humphrys-Dunne for nominating me for this award. Deanie is a children's author of many books, including Tails of Sweetbrier and has a world of knowledge with regards to writing, horses and staying positive. List 11 bloggers I believe deserve some recognition. What is your favorite vacation place? I like being at home by myself. When I am away, I tend to worry too much about whether my dogs and cat are properly taken care of or not. I love winter. It is cold, but I can snuggle up in front of the fire with a great book and hot chocolate. I love being a writer. I love creating new worlds and hanging out with new characters. Where would you most like to live if you could choose anywhere? Somewhere quiet with a very low human population. I live in a very busy street, surrounded by noisy neighbours, which is why the quiet appeals to me. I like black. I think it is more flattering to my fuller figure. What's the most exciting thing that happened to you this year? I had gotten rid of a bad literary agent and now I am free again to make my own decisions. I am a tattoo enthusiast. I only have one, but would like at least two more. Three energetic dogs and a moody cat. What's your favorite kind of pet? I love all kinds of animals, but not reptiles. I am sorry, but they make my skin crawl. What did you like doing most when you were little? I loved the fact that it was okay to be playful and that make believe was allowed. I am sorry, but I hate picking and choosing who gets this award. If you follow my blog you are amazing and you make me feel grateful for all the visits and comments you provide. 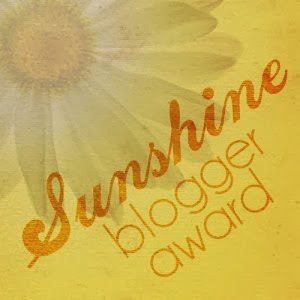 If you follow my blog, please claim this award. You guys are all just so awesome! 3. What is your favorite TV series? 5. What is your favorite movie of all time? 6. What is the name of your favorite book? 8. Do you believe in running, unless you are chased? 9. Do you love nature? 10. What is the name of your favorite author? 11. Do you know how to cook? That is it from me. I hope that you guys won't be shy and will accept this award. Thank you for always being my friends and for being there for me when I need you guys most. So happy the Sunshine Award lifted your spirits, Murees. It's important to be positive so you attract cheerful, wonderful things. All the best to you, as always. Annalisa - Thank you. I can't wait to get more tattoos. It is weird how excited I am. Favorites are winter and black? You rock! And you're concerned about your pets. You're a caring person. Lexa - Poor cat gets teased by them all the time, but she gets the dogs back in the end. Alex - Thank you. I want to rock! M.J. - Hahah! Cake is the best. I can't imagine not having my pets. Hilary - Thank you. They are truly my best friends and I love them for it. Murees, I nominated you for an award. Please stop by deanieblog.wordpress.com to find out more.